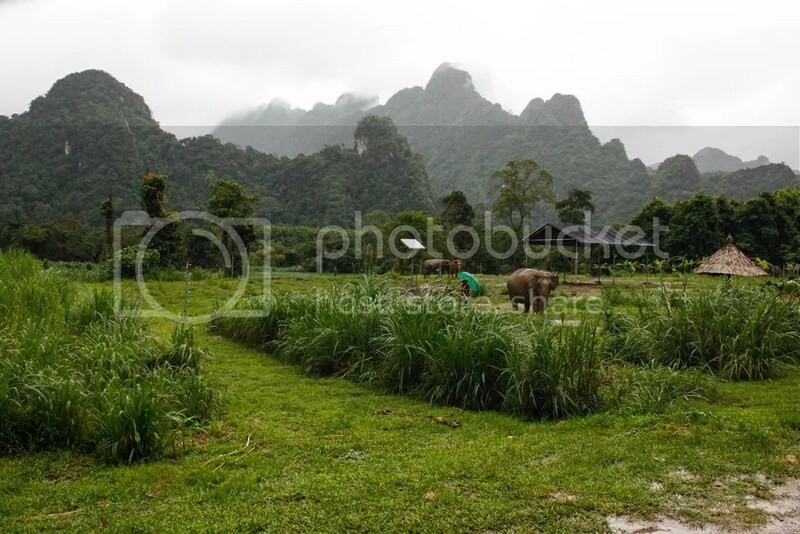 Our first day at Elephant Hills Camp in the Khao Sok rainforest, in which we go canoeing in a monsoon and hang out with elephants. 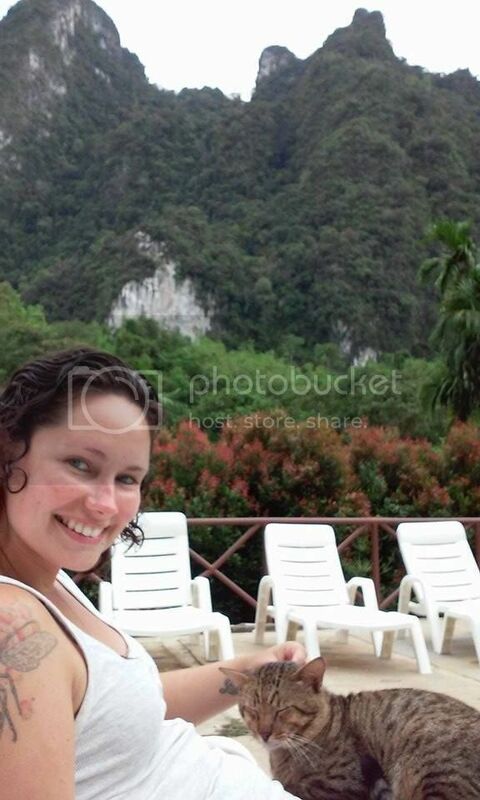 We finally left Bangkok (and our beloved guide Nat) to start the next leg of our journey in Khao Sok. 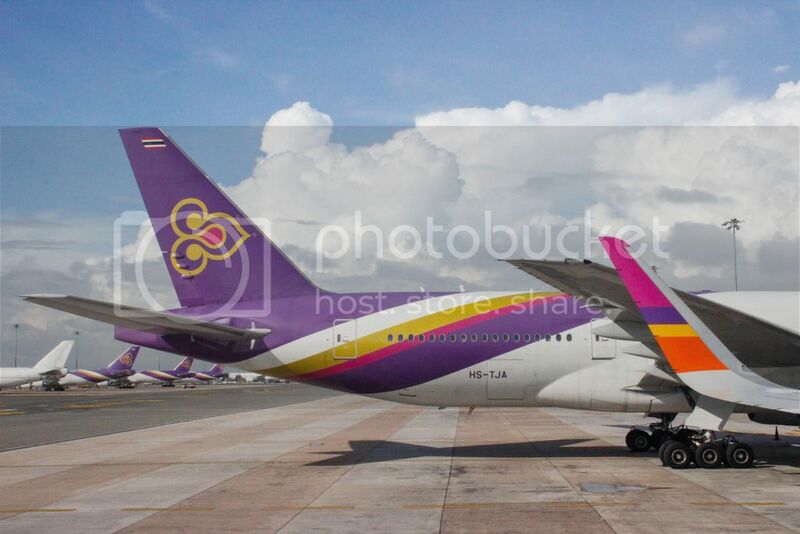 We took a tiny little plane to Surat Thani airport, where we had a driver waiting to bring us the rest of the way. 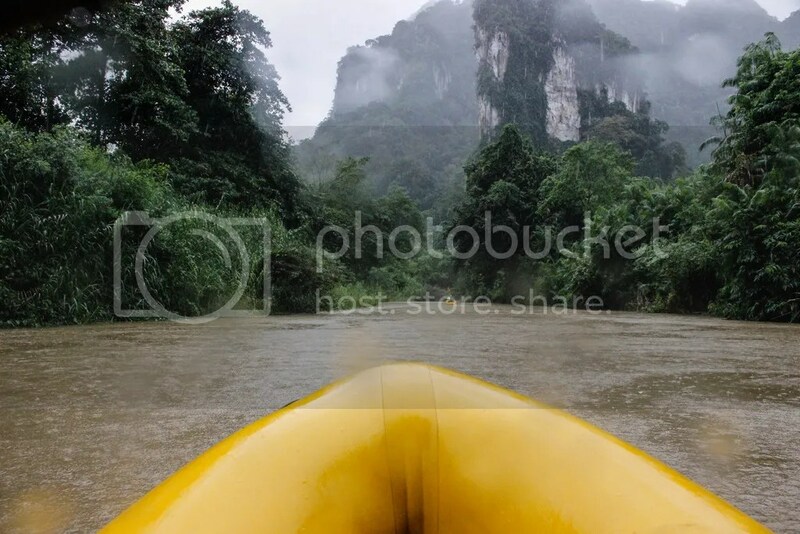 It was about an hour and a half drive through dense jungle – I’d only really seen similar landscapes in Vietnam movies… or maybe Jurassic Park. 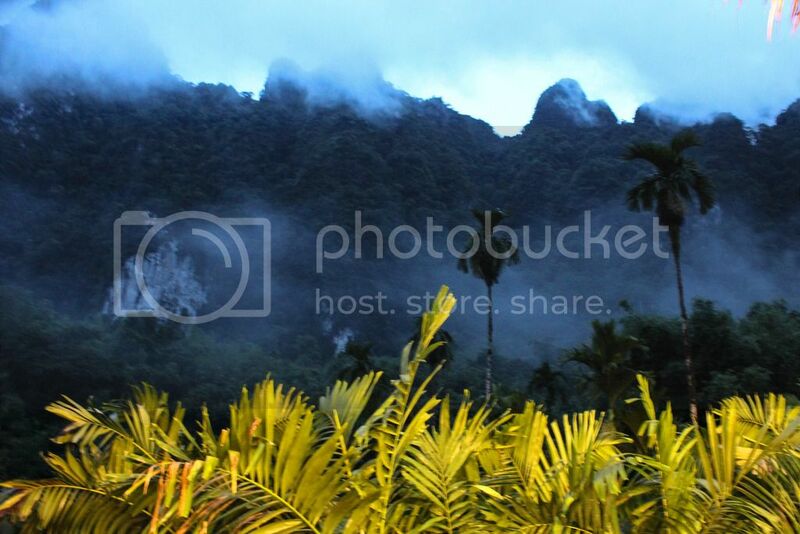 Khao Sok is the largest rainforest in Thailand, all-green with jagged limestone mountains erupting all over. Elephant Hills Camp was incredible. 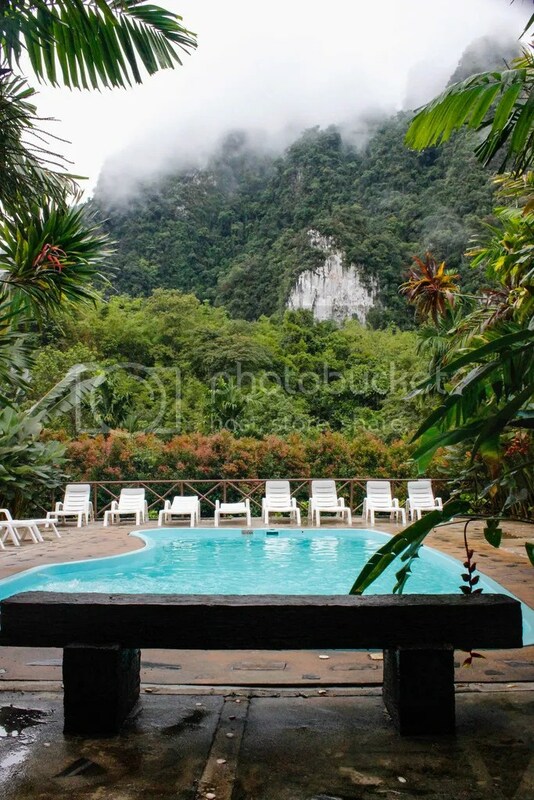 Our pictures really don’t do it justice – set in the jungle, those same dangerous-looking mountains loom in the background with mist constantly swirling around them. I felt like we were in a National Geographic magazine. We were quickly introduced to our guide/host, an sweet dainty Thai girl named Vim. Her name is actually pronounced “Wim,” so I’ll spell it like that from now on. She explained the schedule to us and gave us the keys to our… tent. Check this out. 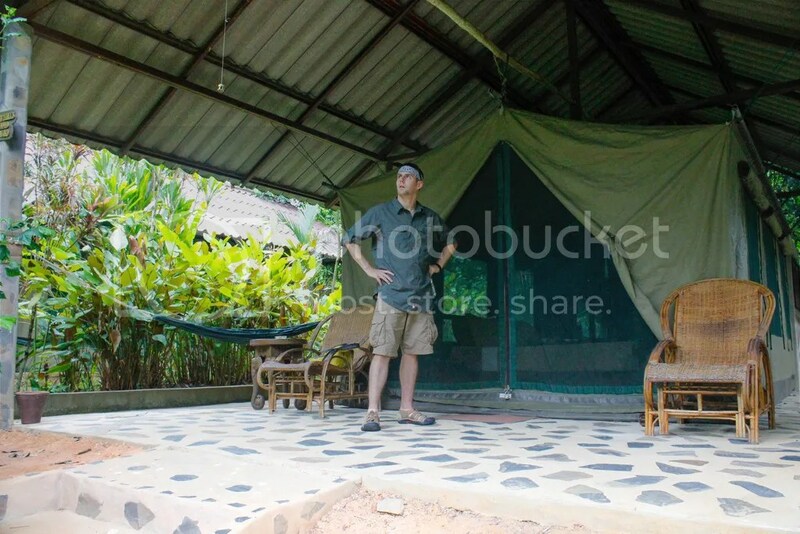 Luxury tents in the Thai rainforest! It was a hell of an experience. 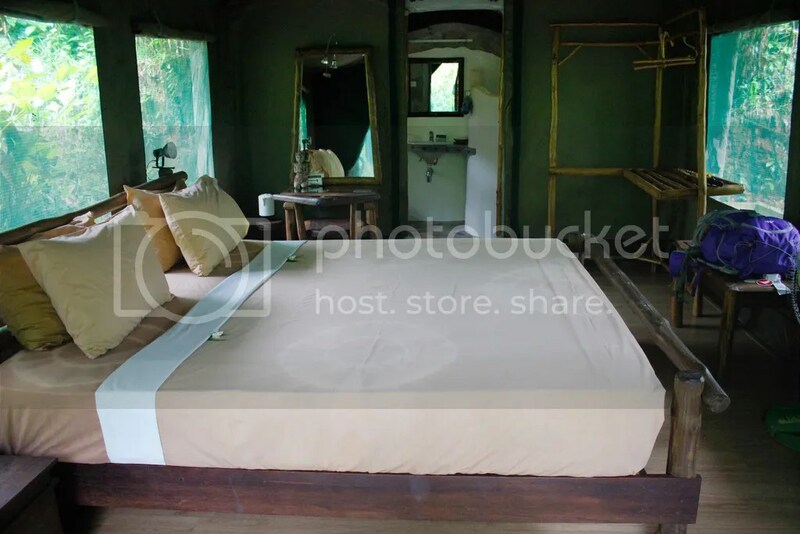 Our tent had a king-sized bed and our own private bathroom with a shower. It was really something else. 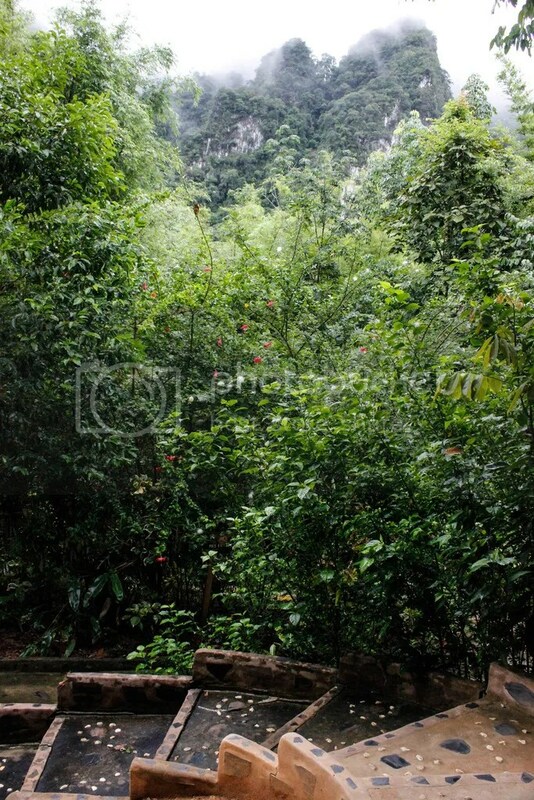 The only real downside that I must mention is that since you’re in the rainforest, everything is constantly damp. We would hang our bathing suits out to dry only to find them just as wet the next day. I think it’s a small price to pay though for the experience you get. 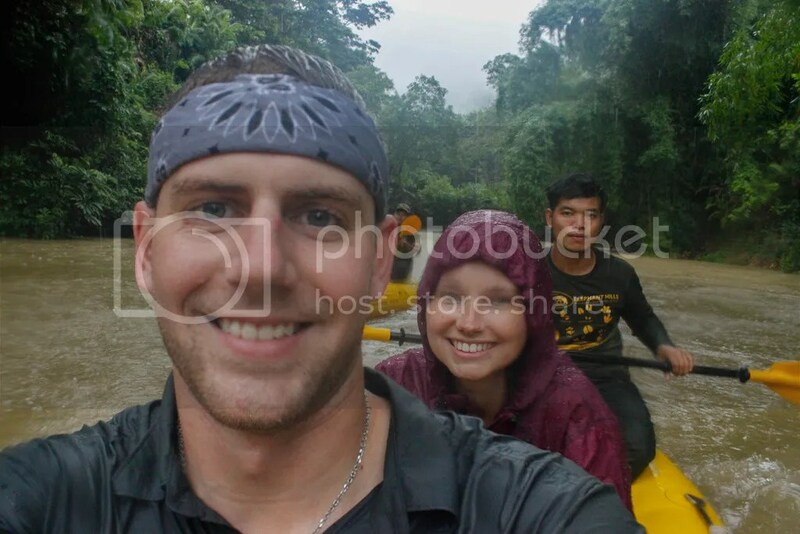 As you know, it was monsoon season while we were in Thailand and apparently the weather didn’t want us to forget it. After lunch (Elephant Hills provides extravagant buffets every day with traditional Thai food, fresh fruit, salad, and even french fries), we started our first day’s itinerary by hopping into an old army-style bus with plastic zipper-windows and terrible shocks. We rattled about 10 minutes down the road. Everyone else in our group had unflattering crinkly-plastic ponchos on except us. I wore my snazzy plum Vicenza rain jacket, and the Husband was apparently too cool for rain protection. In the 3-minute walk between the bus and the put-in area, he was drenched. The nice thing about the rainy season though is that it’s warm – the rain will soak you, but it won’t leave you freezing. 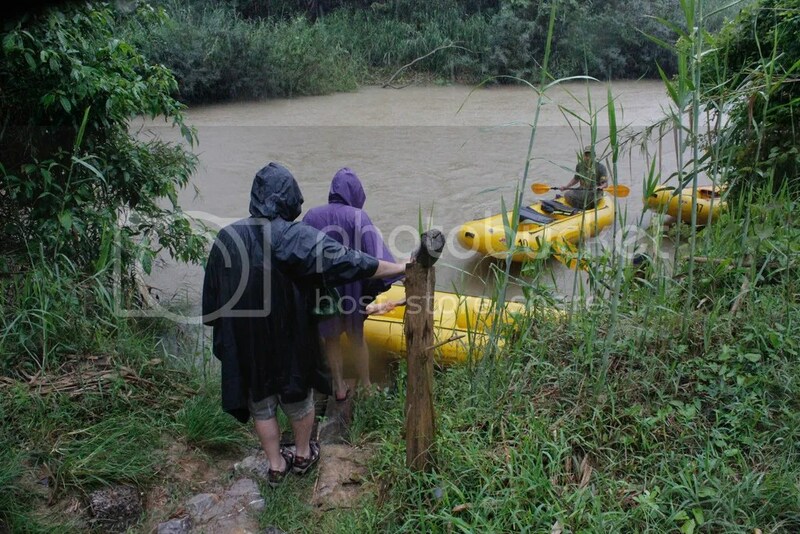 The inflatable yellow canoes all came with a “paddle man” – young Thai guys who work for Elephant Hills, so we got to sit back and enjoy the ride to the best of our ability. 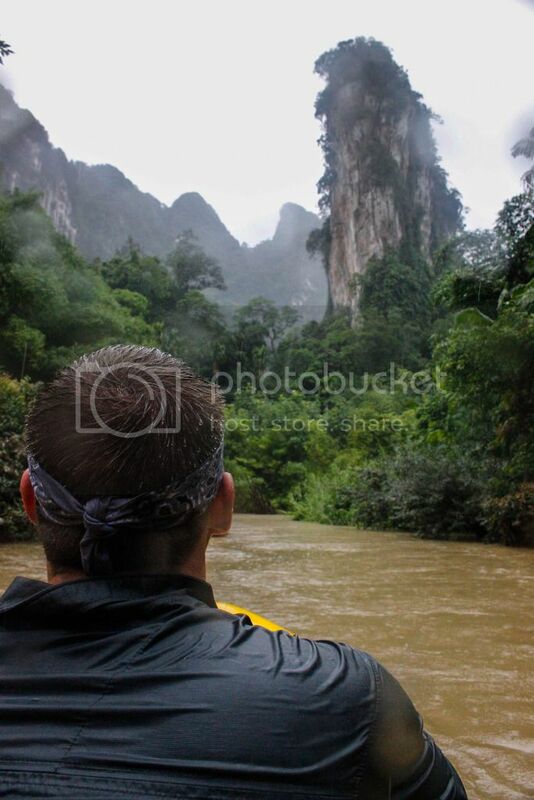 Even with the rain, the river and jungle mountains were beautiful. 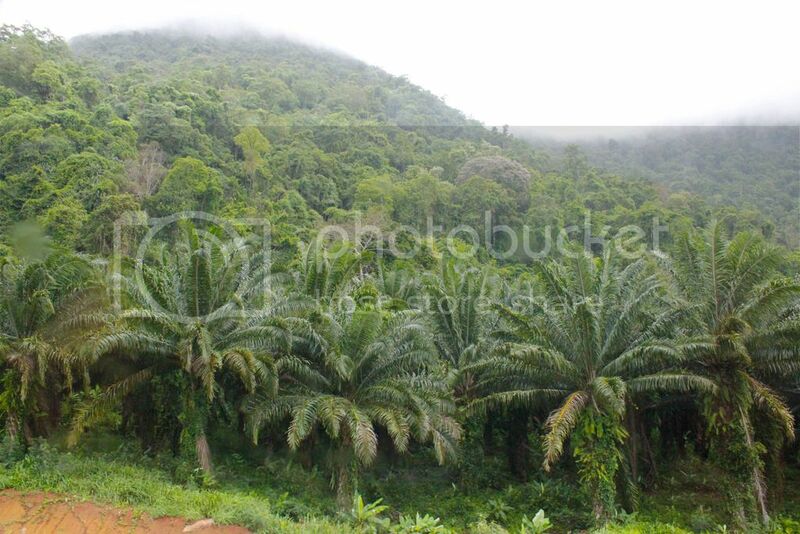 But this was one of only 2 times I wished we had come during the dry season. I brought a rain sleeve for our Canon, and we had it cinched tight to protect all the buttons and screen from the rain. But there’s not a whole lot you can do to keep water off your lens. Before long there were splashes blurring and distorting our pictures and we had to give up. Finally we reach the end of our float and climbed back into the bus. I discovered that my snazzy “rain jacket” was little more than a windbreaker – I don’t think there was a dry inch of me. Oh well, at least I wasn’t cold. From there we drove about 5 minutes to the elephant area of Elephant Hills. 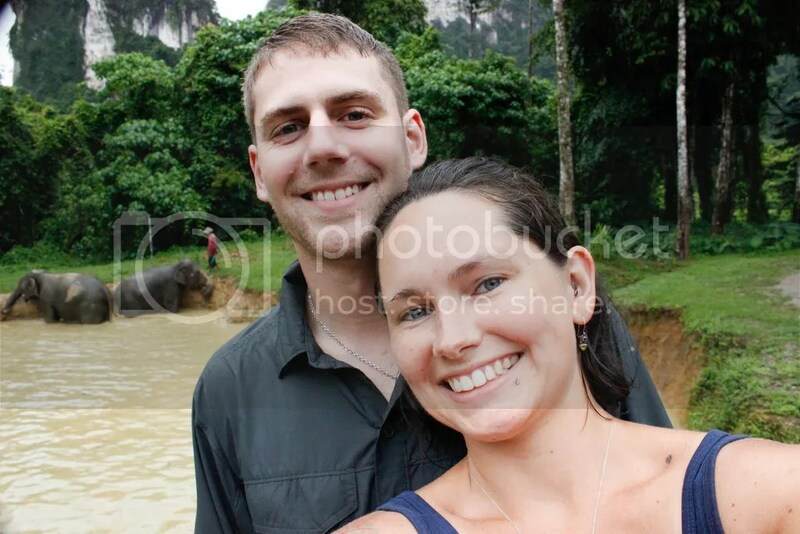 Walking up the road, it was pretty spectacular to see elephants in their native jungle habitat. 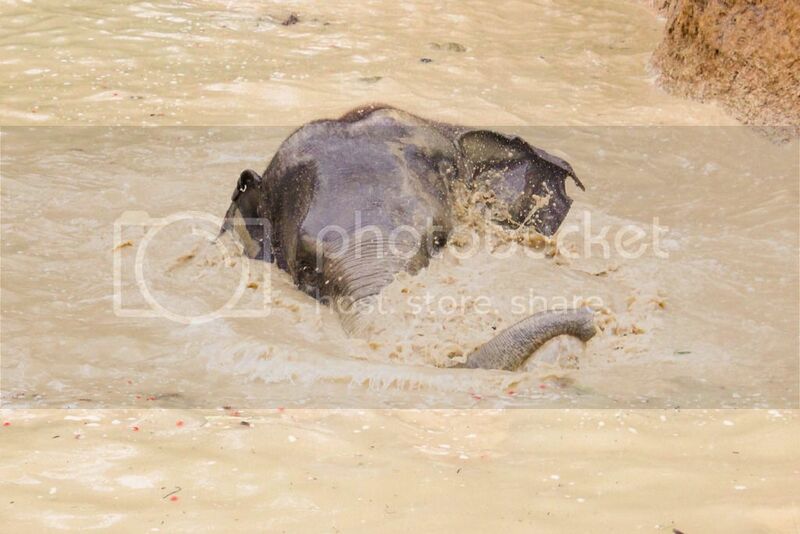 First we were introduced to a couple elephants and got to watch them take a mud bath. They’re so much like dogs…. Well, not my hydrophobic dogs, but most dogs. 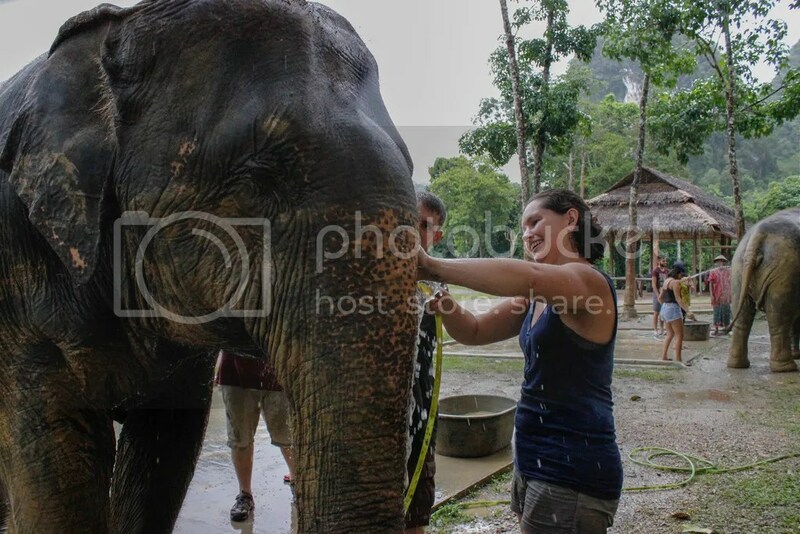 After they’d gotten good and muddy, we had to give them a bath by scrubbing them with rough coconut husks. 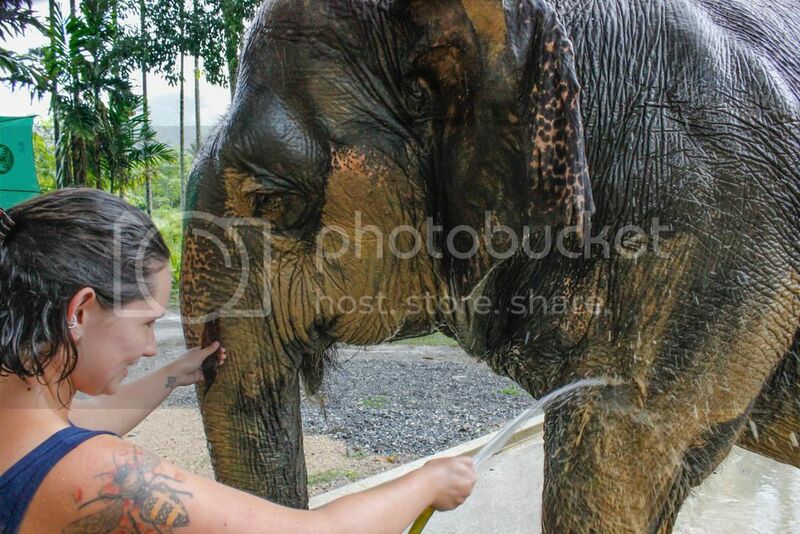 We were instructed to scrub as hard as we could because their elephant skin is so thick. 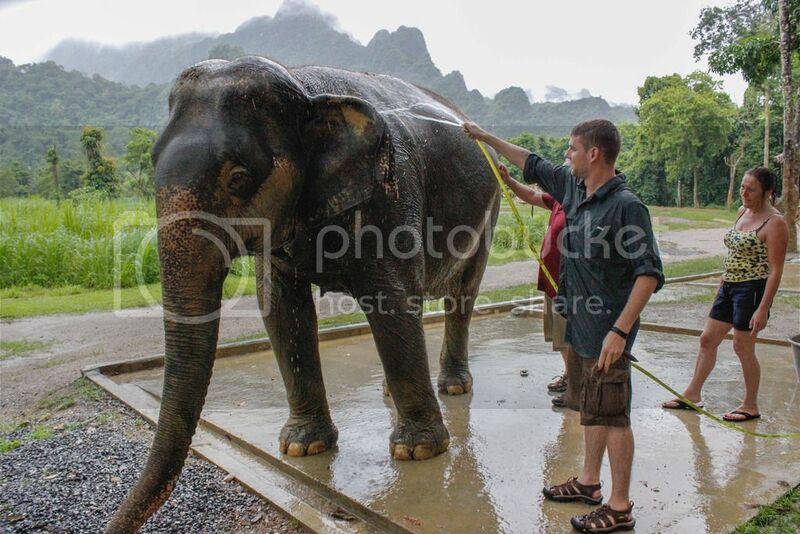 They stood (mostly) patiently while we hosed and scrubbed them down, their mahouts standing by to make them stay put. 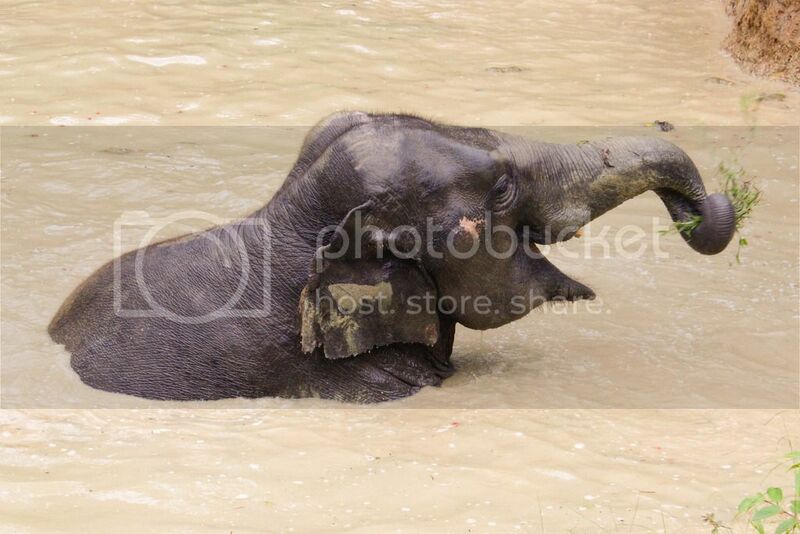 You could tell the elephants were thinking “Ok, enough of this. 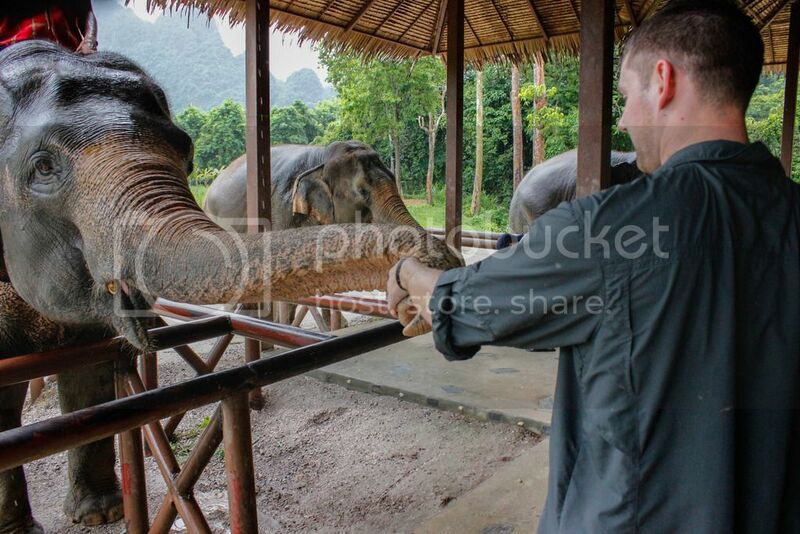 I’m ready to scratch my rump against that tree now,” but the mahout would say a few things and the elephants would grudgingly step back on the platform. 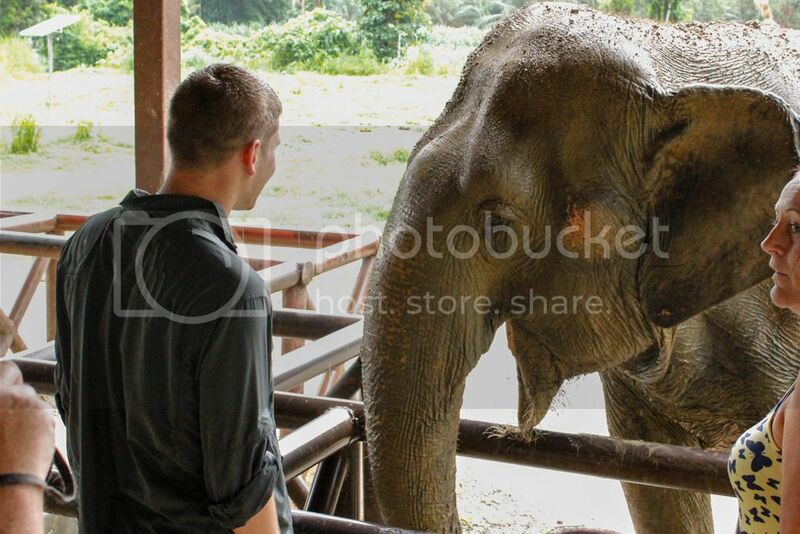 I loved getting to interact with elephants so closely like this. I don’t know if you’ve ever touched a pig before, but they have sparse, stiff bristles that kind of tickle when you pet them. Elephants have the same stuff, but even more sparse and bristly. I realize these ones were relatively tame, but they were so sweet and reminded me of Maddie (one of our basset hounds). It sounds silly, but I swear they could be related. 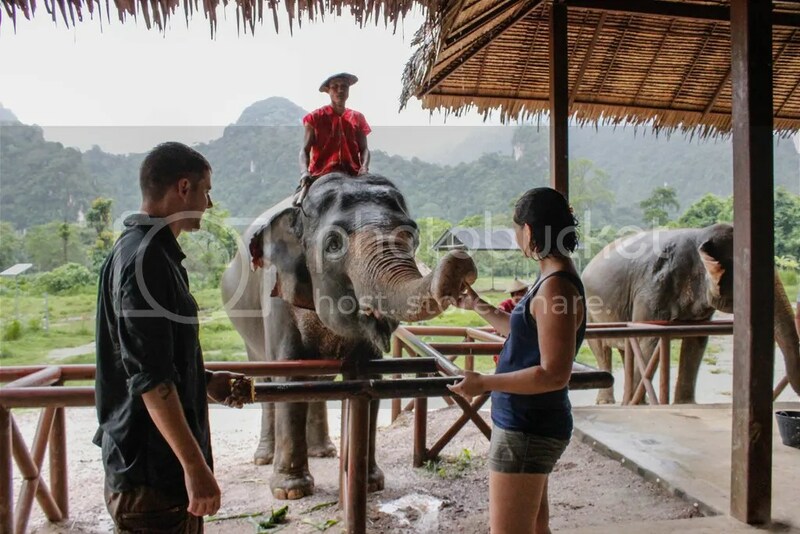 Next we got to make lunch for the elephants. All the food was laid out and we just had to chop it up. 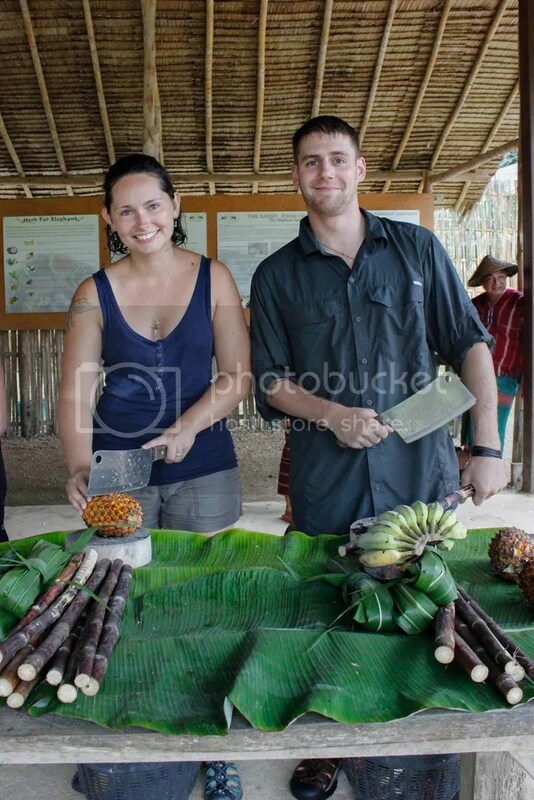 Pineapples, banana bunches, sugar cane, and bunches of long leaves that were like razor grass. 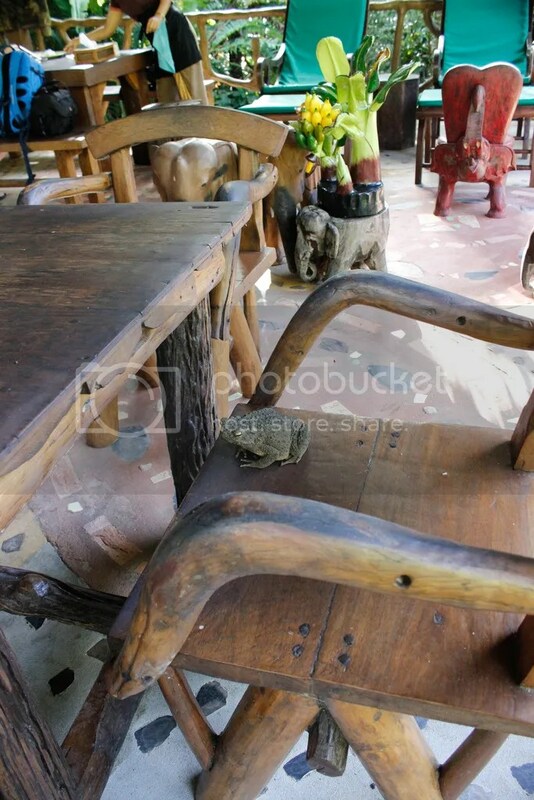 While we worked, more elephants and their mahouts circled around, impatiently waiting for their lunch. When we finally finished we got to dole everything out. Again, much like dogs, some of them were greedy and tried to take several things at once, or grab your food before you were ready. Such buttheads. Then we said goodbye to our new elephant friends, but we got to learn a couple fun things about them. There are two kind of elephants, the African and the Asian. 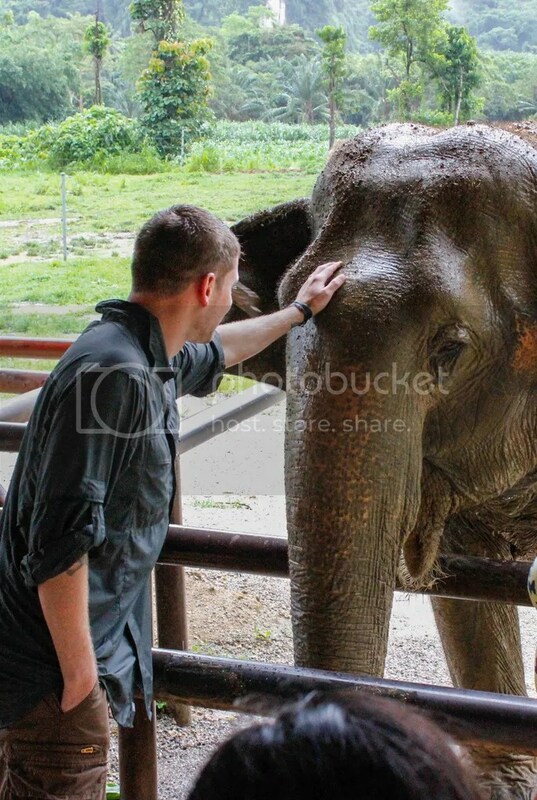 Obviously we got to meet Asian elephants, which are smaller and more easily trained. Asian elephants also start to “turn grey” when they get older by developing pink skin on their faces and trunks, whereas African ones don’t. Another key difference is that only male Asian elephants grow tusks, whereas all African elephants have them. Oh, and they eat just about everything… except durian. You’ll note that we didn’t ride elephants at Elephant Hills. I knew long before our trip that we wouldn’t be and I’m grateful to Backyard Travel for not promoting it. 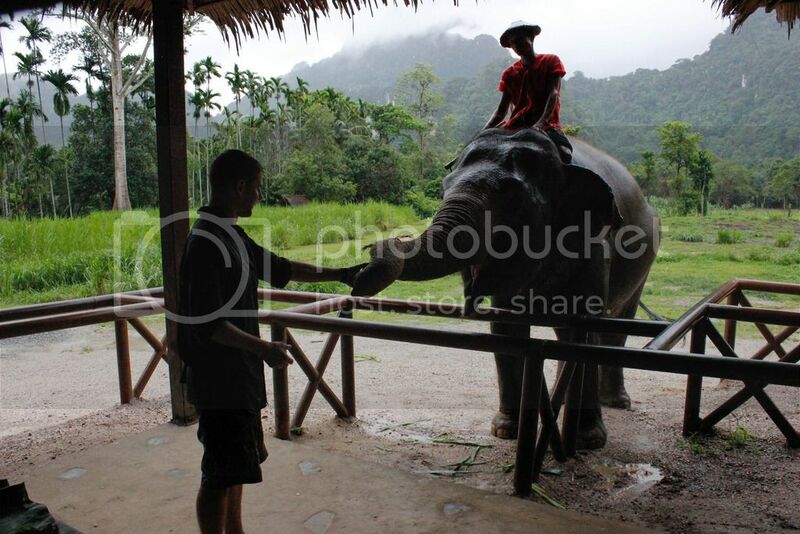 I never even knew elephant riding was bad until a friend posted about it online. 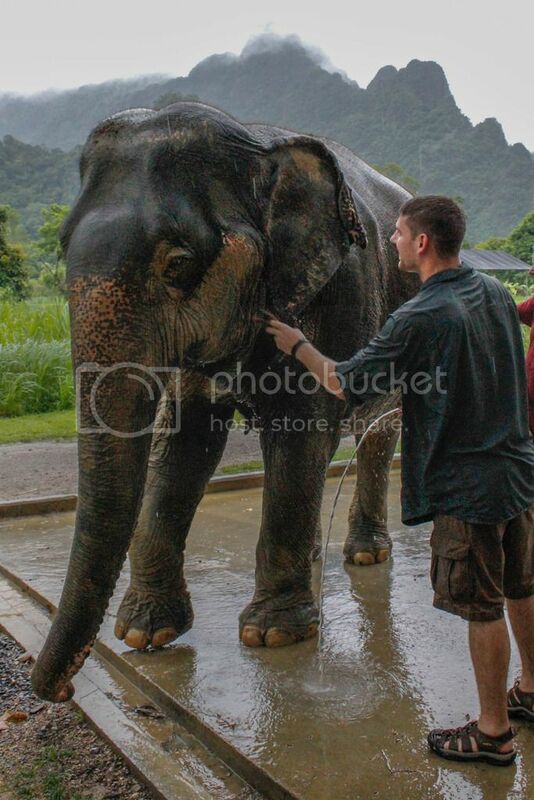 If you’re traveling to Thailand, please consider erasing “ride an elephant” from your to-do list. 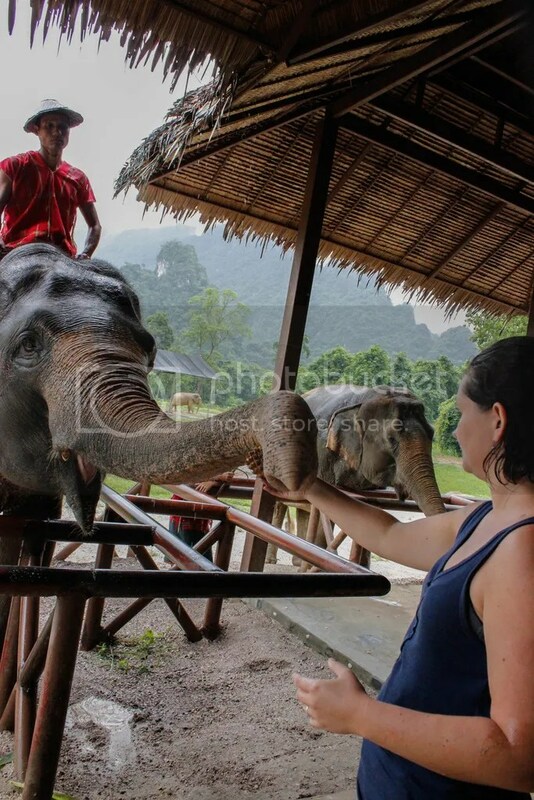 Elephants used in the tourism trade often endure terrible treatment and abuse from a young age. And despite being such large creatures, they’re not designed to carry a lot of weight. Many tourism elephants end their careers with broken spines. If you’d like to know a little more, you can check out this non-traumatic article on Why You Shouldn’t Ride Elephants in Thailand, and what to look for in a responsible elephant sanctuary. There are quite a few in Thailand, but I think most are in Chiang Mai in the north (an area known for elephants) and Khao Sok. Elephant Hills is basically a small retirement village for elephants who may not have had the best life so far. They get to live out their days eating, bathing, and eating some more. I asked how many they had and right now they only have 12, but they are trying to take more. 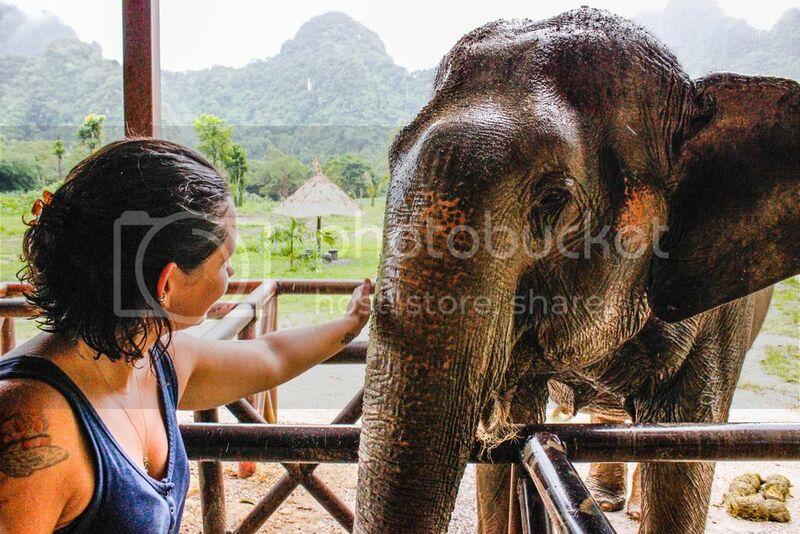 Unfortunately most people don’t want to part with their elephants, so buying them can be very costly (even upwards of $30,000). After hanging out with the elephants it was back to the the camp. Every evening before dinner you’ll get to see a video (about elephants, the rainforest, etc.) and a short exhibition of traditional Thai dance. 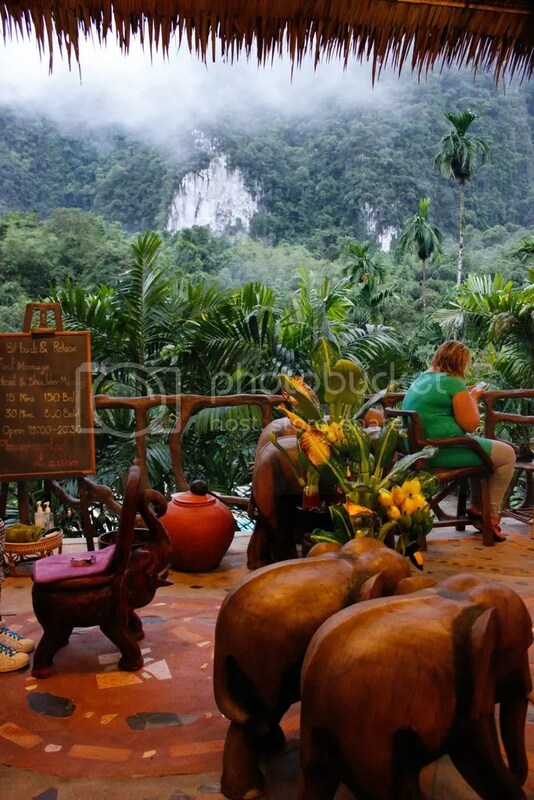 Because it’s such a rural place, most schools are woefully underfunded and education around Khao Sok suffers. 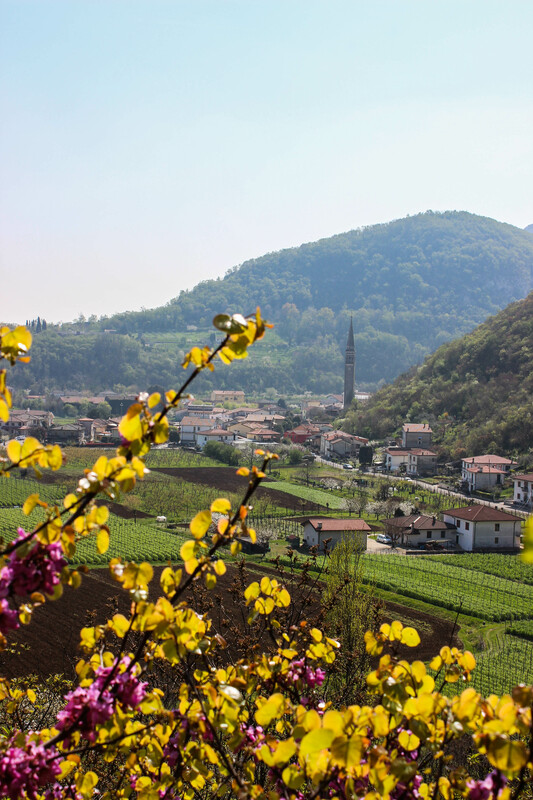 Elephant Hills works with a few local schools, helping fund them to provide better materials and education for children in the area. Luckily for us, this means that the kids come to the camp and show us some of their dances. They offer to take pictures with the visitors at the end, so of course I had to go up. Later the Husband pointed out that I stick my arms out too straight, which I completely didn’t notice. I’m just gonna blame yoga, because that’s something you do in yoga right? Yeah, that’s it… yoga. 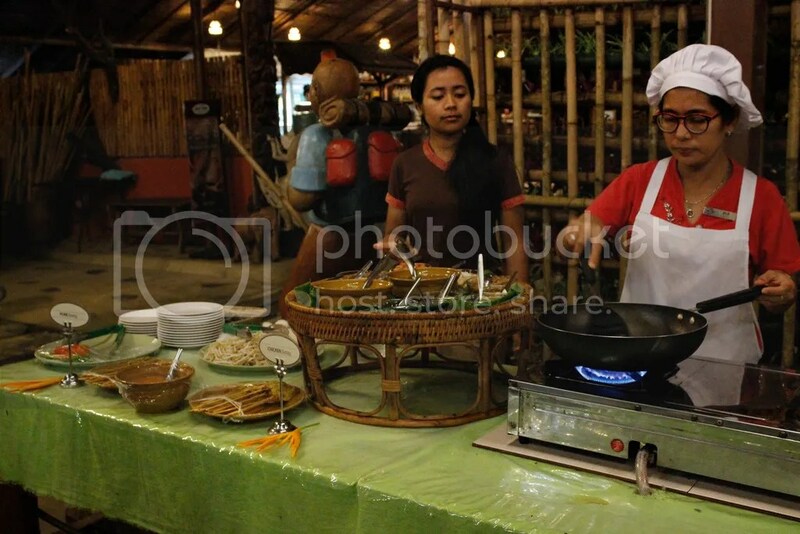 After that, every night has a different cooking demonstration so you can learn how to cook some traditional Thai dishes. The Pad Thai was so much better than I’ve ever had, but of course I can’t remember how to make it. Definitely should have taken notes…. 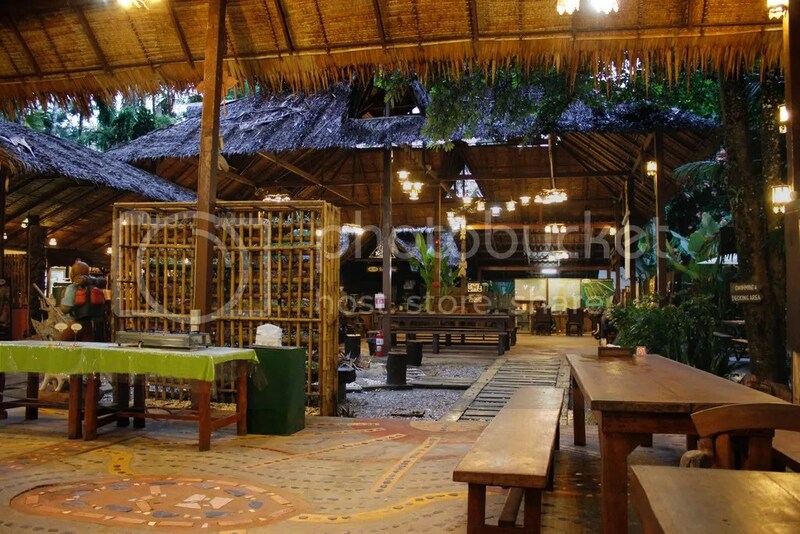 Then during dinner you can watch the bats swoop above your head – everything is open to the outdoors so don’t be surprised to see some wildlife in the common area or even sitting at your table with you. 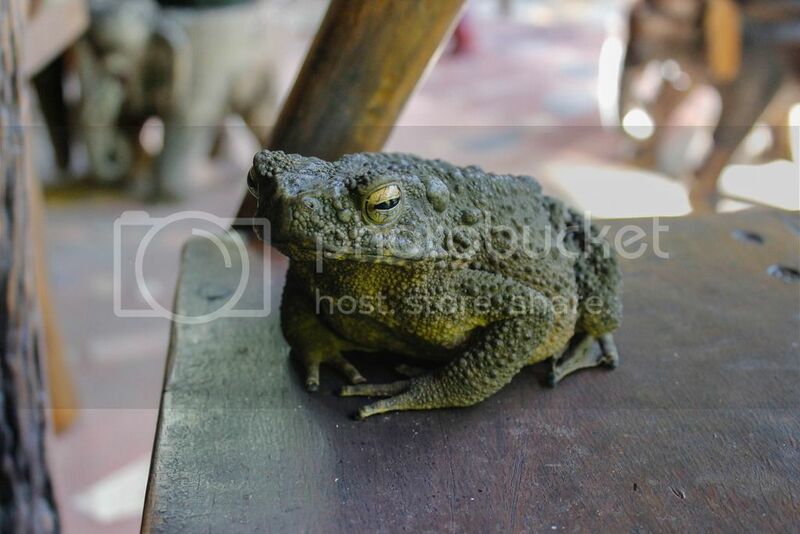 And don’t be fooled into thinking the toad is fake. There are some resident beggar cats, too, who lay on the charm during meals. 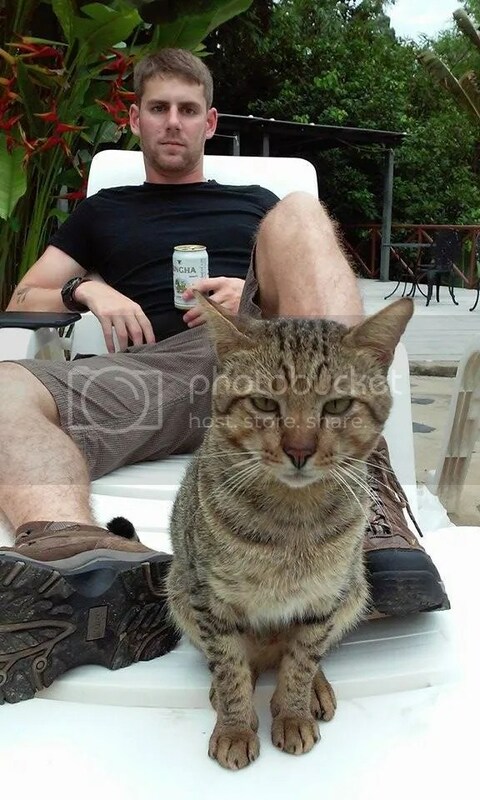 One of them is a gentleman named Tiger who apparently wandered into camp 4 years ago and decided to stay. He and I got to be very good friends even when I didn’t have food in my hand – he was sweeter than most housecats I know. I wish I could have taken him home. Sleeping in a tent in the rainforest is pretty amazing. Aside from being damp, at least. You can hear all the incredible night-noises of the jungle – it’s like listening to one of those go-to-sleep albums with crickets and waves, except the sounds are animals calling to each other and wind rustling in the palm leaves, and they’re real and happening just outside your tent. As you can imagine, I slept very well. Follow along with tomorrow’s entry at Cheow Larn Lake! 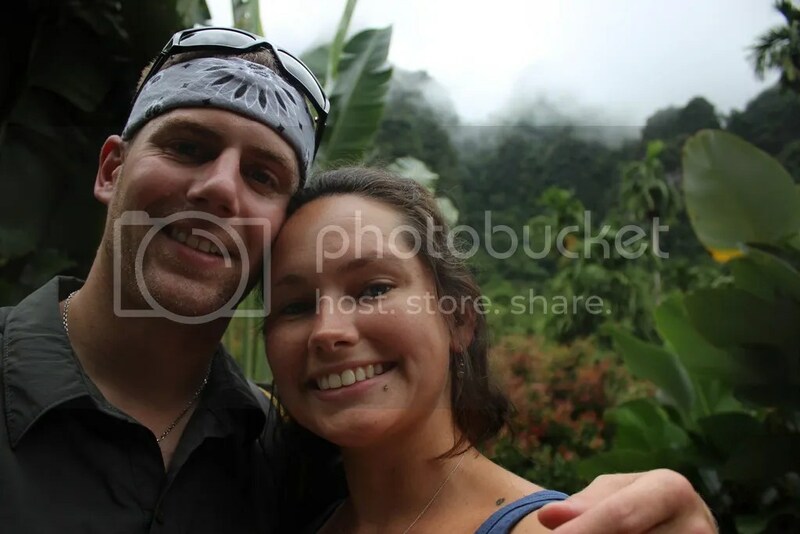 This entry was posted in Asiadventure, Travels and tagged Asia, Backyard Travel, camp, Elephant Hills, elephants, jungle, Khao Sok, luxury tents, rainforest, sanctuary, Thai dance, Thailand, travel. Bookmark the permalink.